Here's a deluxe western dude ranch where preschoolers are taken seriously and horseback riding is open to all ages and abilities. As I glanced around at the striking desert landscape from the back of my palomino horse, it was easy to understand why European families especially love this ranch. It’s the quintessential American southwest – the lonely desert landscape dotted with cacti of all shapes and sizes, the cowboys and cowgirls in their chaps and boots, the paddocks filled with spirited horses, and the vast open sky. It’s the American west of movies and novels, perfect for a dude ranch family vacation. 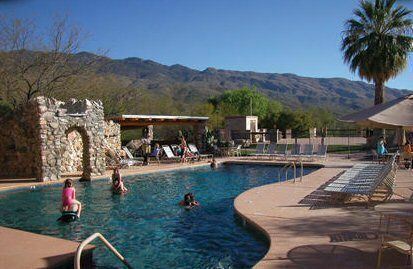 A stay at Tanque Verde lets you enjoy that frozen-in-time western fantasy, whether you’re a child or an adult. If you’re serious, you can master the art of western riding at one of the best riding instructions programs I’ve seen at any dude ranch in North America. Or, you can opt for a couple of simple slow trail rides and spend the rest of your time hiking, mountain biking, playing tennis, swimming, or simply settling down with a good book and sampling a spa treatment or two. 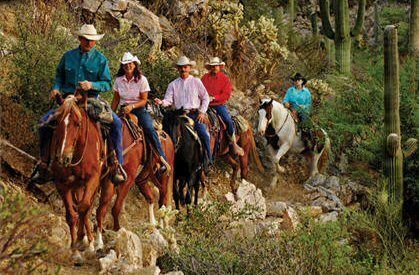 The family-run ranch is situated on 6,000 acres in the Sonoran desert outside of Tucson, Arizona and makes use of another 50,000 acres of adjacent National park and forest land, all available to guests for riding and hiking. Many of its activities are classic dude ranch, like the cowboy cookout in a cottonwood grove complete with cowboy music and poetry; western line dancing classes; and talks on horse behavior. It also offers up–to-the-minute resort amenities, like the spa (massages, body wraps, indoor pool, Jacuzzi) and the accommodations (down duvets, fireplaces and private patios with views of the desert). The riding program reminds me of a ski school where the kids and adults are taught to master the elements of the sport step by step and then move up to the next level – there’s always something new to aspire to. Children start riding as young as the age of 4 and begin in a large ring on gentle horses that are known to be patient and steady. Four- to 6-year-olds slowly and deliberately learn to control their horse and can build on their skills but need to stay in the ring. Children ages 7 to 11 are grouped together and quickly become competent young horsemen and women. Once they master the basics they can go on trail rides, ultimately moving up to “the lope group,” a great honor and also lots of fun because that’s when the horses start to run. They also learn to groom their horse and participate in a “funkana,” which is like a mini rodeo with obstacle courses, barrel races and funny games. 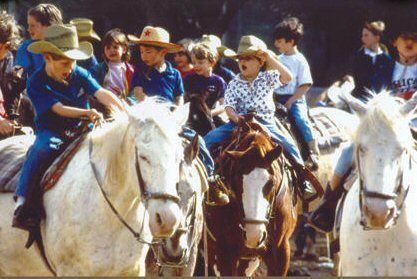 The riding program is the centerpiece of the children’s program for ages 4 to 11, but there are many other planned activities that take place in the designated kids’ room or the designated kid’s dining room. There are tennis lessons, a nature program that operates from the ranch’s nature center, nature hikes, games, and horsemanship classes to name a few. Adults are instructed in horseback riding in a similar fashion, and once they’ve passed the “lope test” they, too, can go on faster trail rides. They also get to try other activities on their horses such as cow penning and barrel racing. 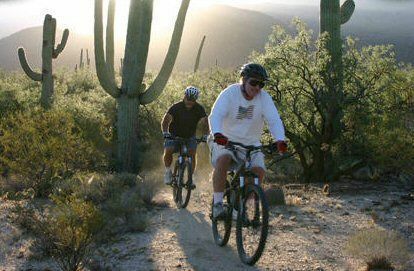 Mountain biking is another must-do activity at Tanque Verde dude ranch. To date, the 20-bicycle fleet is sized more for teens and adults, but the ranch may be getting some bikes for kids soon. Mountain bike rides wind through the stark desert landscape through dry gulches, across arroyos and between 30-foot-tall saguaro cacti. Trails range in difficulty from those suitable for novices to more challenging ones for seasoned fat tire riders or daring teen boys if they pass the bike master’s riding test. A visit to the Tanque Verde Nature Center is a great way to learn about the critters of the desert, a sampling of which reside in cages and aquariums in the center. Some of the children’s nature activities are particularly clever — one of my favorites is designed to teach kids the difficulties animals face in finding and eating their food. To illustrate how birds husk seeds, kids are given wrapped Starburst candies and told to put their hands behind their backs and then try to unwrap and eat them using just their mouths. A variety of naturalist-led hikes begin from the nature center. Tennis is a big draw, with five courts and one night-lit court. The saddle-shaped swimming pool isn’t huge but it has a nice broad waterfall that spills into it providing a fun diversion for kids horsing around in the pool. The spa has an indoor pool, sauna, whirlpool, exercise room, massages and treatments. And just like every good dude ranch, there is a horseshoe pit plus volleyball, basketball and catch-and-release fishing. Several golf courses are nearby. The ranch accommodations are comfortable and elegant, but do not have television sets. Ranch owners Bob and Rita Cote want to get you and your family out of your rooms and down to the nature center, the slide show on birds of the desert, into the game room, or simply out in the open gazing at the star-packed desert sky. Most rooms come with a kiva fireplace, and some of the accommodations are set up for families with a suite configuration and bedrooms that can be added on through connecting doors. The deluxe suite has an enormous high ceilinged sitting room with two double Murphy beds for the kids and a king bedded master bedroom. Another bedroom can be added on. Every room has a private patio with comfortable lounge chairs and breathtaking views. 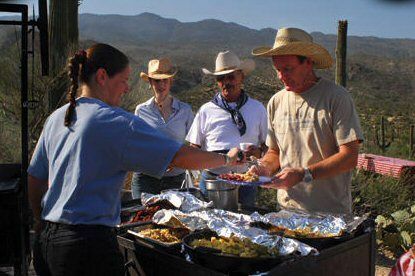 Tanque Verde serves up its meals in the quantity that you’d need if you’ve been out on your horse working on the ranch the entire day. Breakfasts offer a buffet of all kinds of fresh fruit winter and summer, and menu-ordered items such as the whole-wheat nut pancakes, topped with sprinkling of crunchy walnuts, sesame, poppy seed, and slivered almonds. Add butter and maple syrup to that and you’re ready to ride. 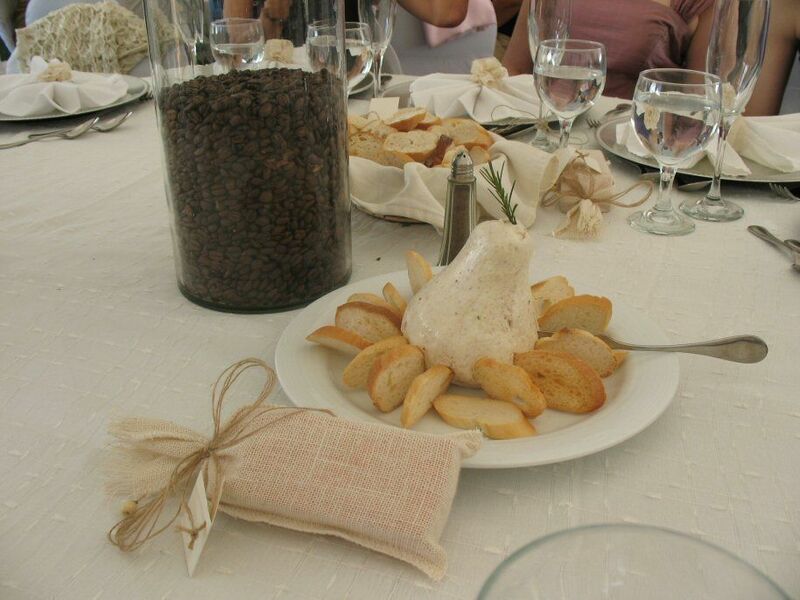 Lunch is buffet style and dinner can be both buffet style or menu-ordered, depending on the day. 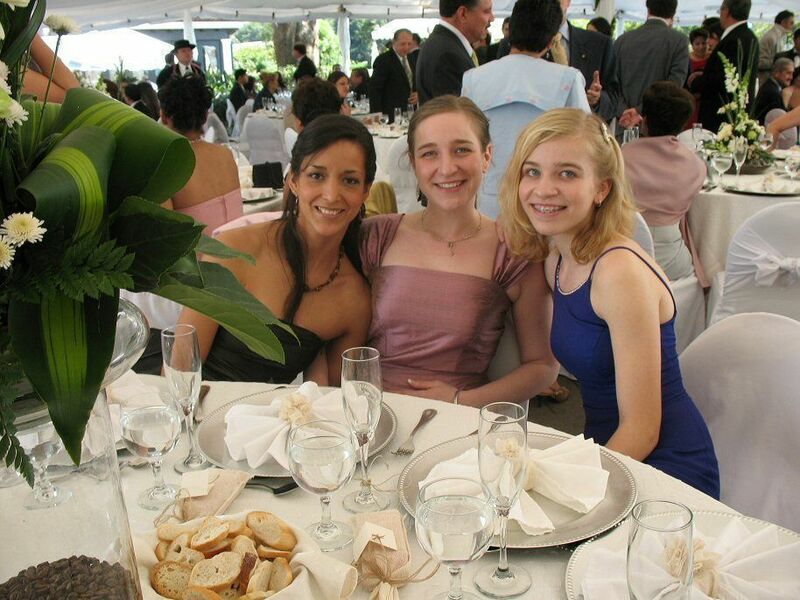 It’s often themed, such as a Mexican night complete with mariachi entertainment and south of the border specialties. Tanque Verde Ranch (800234-2833; 520/296-6275) is located at 14301 E Speedway Blvd, Tucson, AZ 85748 and is open year-round. 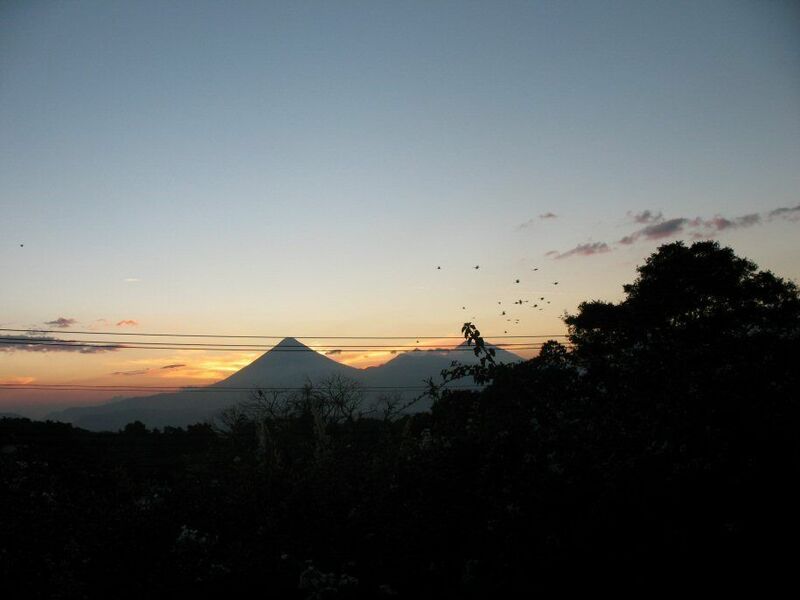 In the hot summer months, many of the outdoor activities are moved to early morning – the first hikes go out at 6:30am and the first horseback rides go out at 7am. Early mornings are the best times to see the most animals as they go about their business before it gets too hot. There are 180 species of birds that live in the area or fly through, and fascinating reptiles and mammals like the javelina, a small pig-like animal with a sweet face. On summer afternoons, there are indoor nature programs and of course the swimming pools or a siesta in your air-conditioned casita. In addition to the terrific riding programs, this ranch has won the Travel Channel’s Top 10 Family Fun Resorts prize three years in a row. 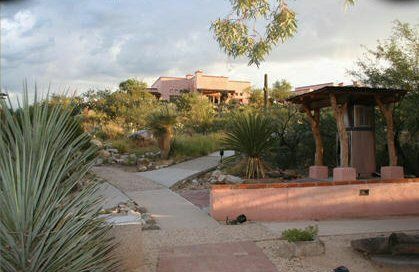 For 2010, at Tanque Verde, all-inclusive room rates range from $235/N-$350/N per person in the winter and $195/N-$295/N per person in the summer for first two people in the room; the third and fourth guest pay less per night. The riding program and all activities and meals are included with the exception of alcoholic beverages and spa treatments. Children under 4 are free. Discounts and specials are most common during the summer months, when the ranch climate is at its warmest.